From ancient times, Europe has been shaped and re-shaped by military campaigns involving more than 2,000 battles. 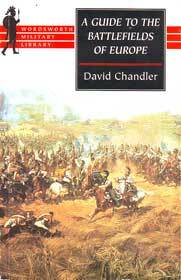 With the help of a team of eminent contributors, David Chandler has assembled a comprehensive guide to 245 battlefields, giving basic facts regarding the location, historical context and objective of each of engagement, details of the opposing forces, casualties and outcome, and a useful bibliography concerning each. 388 pages, SB, B & W photos, 8.5 x 5.5in.